Put your Blockchain App related worries to rest with Cigniti. Get your Blockchain apps tested for API, Functionality, Integration, Security, Compliance, and Performance. To be successful, Organizations across the globe today are looking for a secure platform using which they can transparently share information and build absolute trust. The Blockchain technology is transforming businesses by helping them collaborate better, share information and track assets safely. The benefits of blockchain-enabled precision, security, and efficiency are being enjoyed by multiple sectors and domains, such as finance, healthcare, retail, and more. Blockchain can be segmented by the kind of access points it offers. To begin with, there are 3 popular types of Blockchains. Considered to be “fully decentralized”, a public blockchain has no restriction on access, is secured by cryptoeconomics, and anyone can read, send transactions to and participate in. Single companies that target B2B users use the semi-private blockchains. These blockchains are managed just like private web applications or how a company runs a website. A few examples include ones for government entities for record-keeping, land titles, public records, etc. A private blockchain is an absolutely restricted blockchain with defined access by network administrators thereby providing a greater level of privacy. A blockchain where a pre-selected set of nodes controls the consensus process is a consortium blockchain. In such a blockchain, the right to read the blockchain may be public, or restricted to the participants. Some examples are banks and energy. These are also referred to as federated blockchains. Contact our experts for all your blockchain app testing related needs! Understanding the current application and implementation of Blockchain is important, as it will help determine the growth path and probable challenges with the technology. At Cigniti, we are well in sync with the key trends that will add up to the need for adopting Blockchain technology. A critical role that blockchain can play within the realms of AI is to enable a seamless exchange of big data, the analysis of which forms the basis of all machine learning (ML) and AI. Blockchain technologies – esp. private blockchains, are today spearheading digital transformation, automation, codification of complex contracts, digitalization of processes, and tokenization of physical assets. In the insurance sector, blockchain technologies will enhance the automation of claims processing, subrogation, and other complex processes. Banks & financial institutions can cut costs by about 30 percent in same-day international remittance transactions using blockchain. The theoretically tamper-proof Blockchain technology provides for a cost-effective, fast, flexible and robust security framework for IoT. Blockchain can help the IoT world becoming unshakeable by implementing a decentralized ledger framework for all its data points across people, devices etc. With data security and integrity already a huge concern in the field of IoT, Blockchain will have a critical role to play going ahead. Blockchain, with its theoretical immutability, will prove to be a critical technology for ensuring safety and successful implementation of related protocols. As Blockchain paves the way for innovations across industries that will eventually impact our day-to-day lives, it becomes imperative for organizations to pay heed to the quality and testing needs of these technologies. Blockchain adoption comes with its inherent challenges – high initial investments, integration issues with legacy systems, high energy consumptions, privacy and security issues, and apprehension around the adoption process. Hence, testing blockchain apps becomes business-critical. While there are multiple platform vendors that offer recommendations for Blockchain implementation, you need to understand and decide what really suits your business needs, and syncs well with your objectives. At Cigniti, we firmly believe in blending technology and business objectives, and work with you to achieve success using an agile environment focused on quality@speed. Where could the problems come up? What is the disaster management or back-up plan in case of failures? At Cigniti, we provide focused testing services for BlockChain applications. The testing scenario for blockchain applications can involve validation mechanisms as well as testing for Shift-left approaches, API-testing, Functional Testing, Non-functional Testing, Integration Testing, Security Testing, Compliance Testing and Performance Testing. It can even comprise specialized testing such as Peer/Node testing and Smart Contract Testing. The type of testing to be performed depends on what’s the testing objective. Our experts work with you to understand your requirements and help you come up with the right strategy for your needs. At Cigniti, we work with you to gauge the depth of your Blockchain application and help you derive the best possible ROI from the technology. With our expertise in Digital Assurance and testing over the years, we use the latest, competitive-edge, and evolving technologies to help you bring efficiency and cost-effectiveness with easy adoption. We look at how your application interacts with external factors such as network, users, transactions, and much more. This helps us to leverage the technology platform to build a ‘realistic’ application for the users. We have established a Shift-Left approach with early test automation, performance testing, security testing and service virtualization. We have built a SMAC stack with digital assurance services that offer enriched customer experience. We perform Risk-based testing using design failure modes, effects and criticality analysis (FMECA). Over the years, our experts have developed robust operating models, automation frameworks, and IP-led expertise to help clients achieve their intended business objectives by leveraging new technologies. 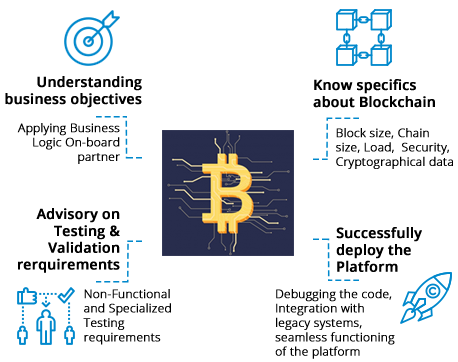 We offer complete Blockchain testing solution to ensure robust Blockchain network and application. Drop us a message below, and our experts will get back to you in a jiffy!